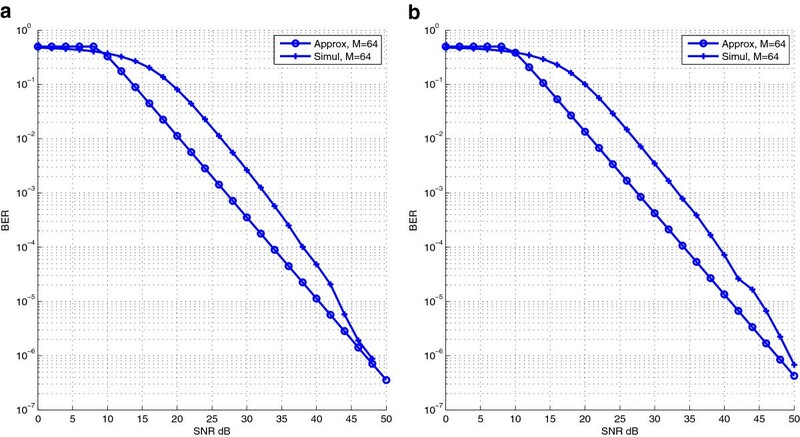 This paper addresses the performance evaluation of the multiple input multiple output (MIMO) precoding technique, referred to as max-dmin precoding, over fading channel with impulsive noise in a railway tunnel. Measurements showed that the received signal at the antenna on the moving train roof near the catenary suffers from electromagnetic noise interference (EMI). This implies that the traditional Gaussian noise model is no longer valid and an impulsive noise model has to be considered. Based on this observation, we investigate the performance of the max-dmin MIMO precoding technique, based on the minimum distance criterion, in an impulsive noise modeled as an α-stable distribution. The main contributions are (i) a general approximation of the error probability of the max-dmin precoder, in the presence of Cauchy noise for an n r ×n t MIMO system, and (ii) the performance evaluation, in terms of bit error rate, of a complete communication system, considering a MIMO channel model in tunnel and impulsive noise, both obtained by measurements. Two soft detection techniques, providing the soft decisions to the channel decoder, are proposed based on the approximation of the probability density function of the impulsive noise by either a Gaussian or a Cauchy law. 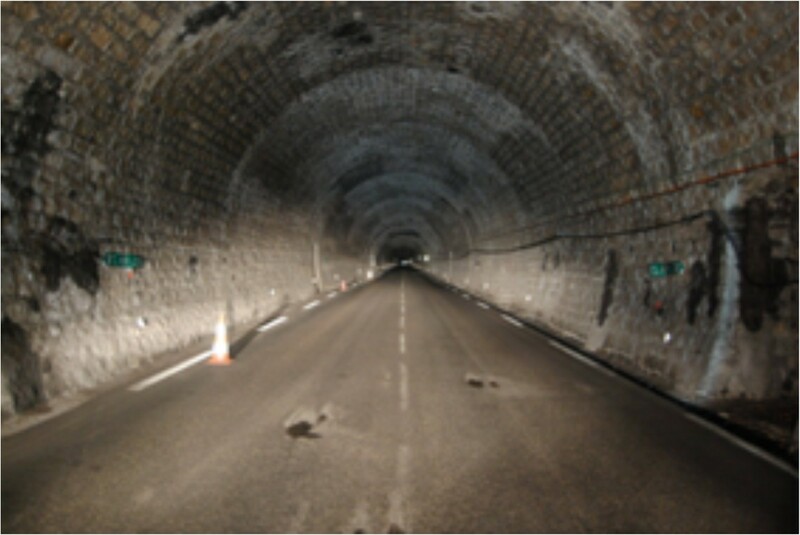 Spatial diversity offered by multiple input multiple output (MIMO) techniques can help to provide efficient transmissions in underground tunnels . In the field of public transport, particularly in subway tunnels, MIMO techniques can improve the system performance in terms of data rate, robustness, and availability . Moreover, when the channel state information at the transmitter (CSI-T) is known, precoding techniques permit to compensate the channel impairments such as spatial correlation between antennas and can improve the overall performance drastically, particularly in confined environments . Indeed, precoding is a processing technique that exploits CSI-T by operating on the signal before transmission. MIMO precoding typically makes use of singular value decomposition (SVD) to convert the MIMO channel, represented by a full matrix, into parallel subchannels, without any interference. MIMO precoding is of great practical interest in wireless communication and remains an active research area, fueled by applications in commercial wireless technology. 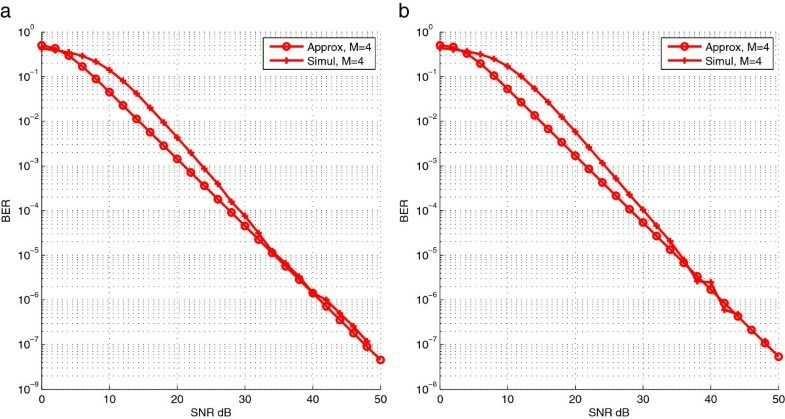 In this paper, we consider a closed-loop MIMO precoder based on the maximization of the minimal distance, referred to as max-dmin precoder. Indeed, the max-dmin precoder outperforms other kinds of MIMO precoders in terms of bit error rate (BER) performance, particularly in correlated propagation scenarios [2–4]. Moreover, it provides a high spectral efficiency compared to the single antenna scheme. In general, the analyses of MIMO system performance so far have been performed assuming an ideal Gaussian noise model. However, this model is not representative of real environments in railway systems, where impulsive noise can be identified. Several models of impulsive noise have been proposed in the literature: mixtures of Gaussian [5, 6], the generalized Gaussian , the generalized t distribution , the distributions of Middleton [9, 10], and the α-stable laws [11, 12]. The effects of these impulsive noise distributions on OFDM systems and power line communications have been largely investigated [13, 14]. In , the authors considered the effect of a mixture of Gaussian noise and impulsive noise (α-stable distribution) on typical single input single output (SISO) techniques. Some more recent works on MIMO systems also considered impulsive noise distributions. In , the performance analysis of three typical MIMO systems - zero forcing (ZF) system, maximum likelihood (ML) system, and space-time block coding (STBC) system - was performed in a mixture of Gaussian noise and impulsive noise. The upper bound of symbol error rate (SER) in this mixed noise was derived for each system. 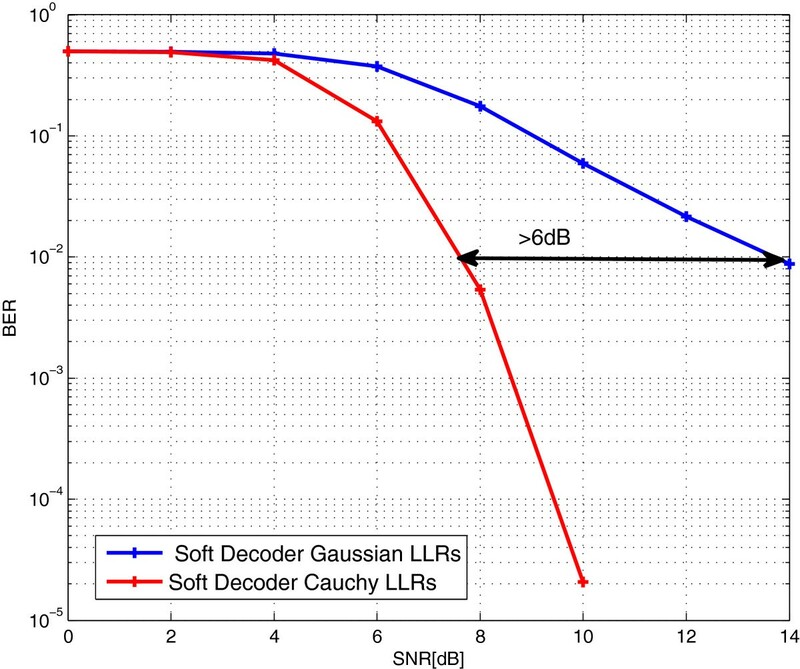 In , authors analyzed the symmetric α-stable (S α S) noise component after performing ZF filtering in the receiver and deduced a probability density function (pdf) approximation of the S α S noise component by using Cauchy-Gaussian mixture with bi-parameter model. Based on this approximated pdf, they provided a closed-form expression of the BER performance in MIMO systems. Nevertheless, none of those works has considered MIMO precoding. In this paper, we focus on the max-dmin MIMO precoder in the presence of a specific impulsive noise, whose model was obtained thanks to measurements on the antenna dedicated to Global System for Mobile Communications-Railways (GSM-R) situated on the roof of a running train. The measurement campaigns were carried out on trains running at a speed between 160 and 200 km/h. They showed that an intermittent source of electromagnetic interference (EMI) is received by the GSM-R antennas . The EMI is generated by the electric arc emissions due to the sliding contact between the catenary and the pantograph. The variables that influence the electric arc emissions are the contact wire surface conditions, the pantograph sliding contact conditions, the temperature, the train speed, the amplitude of the collected current, the mechanical suspensions reaction, and in general the mechanical characteristics of the catenary system . 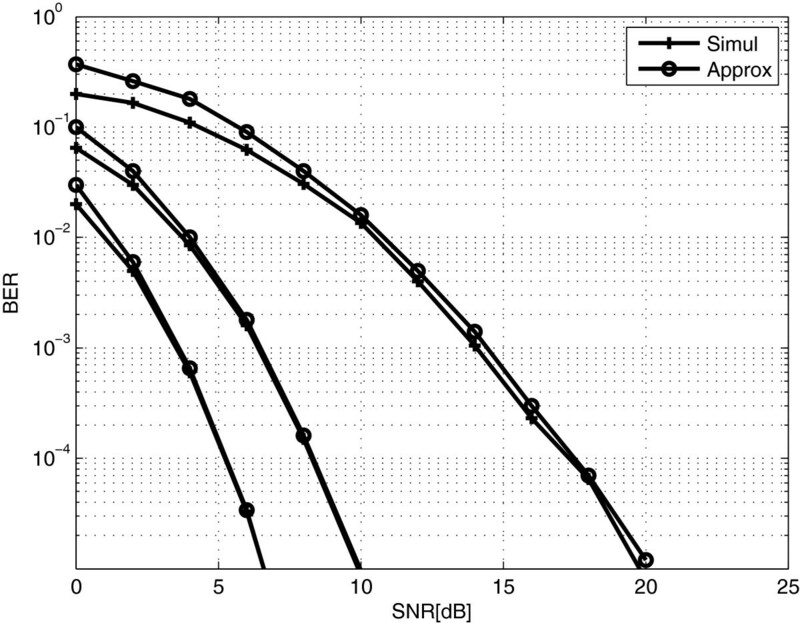 The noise distribution measured in  is well approximated by a S α S distribution . We present a new approximation of the error probability of the max-d min precoder, in the presence of Cauchy noise. This approximation is available for any number of antennas and any rectangular quadrature amplitude modulation (QAM) modulation order. This is an extension of our previous work only valid for 2×2 MIMO system and 4-QAM modulation , using the pdf statistic of minimum Euclidean distance of the received constellation of a precoded MIMO system with rectangular QAM modulations. We apply our precoded MIMO solution on a practical transmission in a tunnel. The transmission involves a realistic channel model in tunnel, including impulsive noise and MIMO channel, both based on measurements and a communication system close to Wi-Fi technology, including a channel code. Since the channel decoder has to be fed with soft decisions by the MIMO detector, two soft detection techniques are proposed, based on the approximation of the probability density function of the impulsive noise by either a Gaussian or a Cauchy law. The rest of the paper is organized as follows. After describing the system model with S α S noise in Section 2, Section 3 details the error probability analysis of the max-dmin precoder assuming full channel state information (CSI) at the receiver side and perfect channel estimation in a theoretical Rayleigh channel. Section 4 highlights practical performance results considering a MIMO channel measured in a real tunnel environment. Conclusions and perspectives are presented in Section 5. Throughout the paper, boldface characters are used for matrices (upper case) and vectors (lower case). Superscript (·)∗ denotes conjugate transposition. I M stands for the M×M identity matrix. ∥·∥2 and ∥·∥ F indicate the two-norm and the Frobenius norm of a matrix, respectively. ℂ m is the m-dimensional complex vector space, N c 0 , σ 2 is the complex normal distribution. λ is the wavelength. where y is the complex received symbol vector, x is the complex transmitted symbol vector of b streams such that b≤ min(n t ,n r ) and E=[x x∗], F is the linear precoder respecting ∥ F ∥ F 2 = E t where E t is the total transmit energy, n ∈ ℂ n r × 1 is a complex S α S noise vector, and H ∈ ℂ n r × n t is the Rayleigh decorrelated channel matrix. In Section 4, H will be described by a Kronecker model to account for the spatial correlation measured in the tunnel. ϕ t = e iμt − γt α . The probability density function may be numerically calculated using the inverse Fourier transform of Equation 2 or 3. In , a distribution fitting of the measured transient EMI acting on GSM-R antenna on the train roof revealed that the measured data in  is well modeled by the S α S distribution. Table 1 gives the parameter values of the distribution, estimated by . y = G d H v F d x + G d n v .
F d = arg max F i d min F i , where d min F i = min x k , x l ∈ C , x k ≠ x l H v F i x k − x l .
The corresponding minimal Euclidean distance for these two precoders, referred to as Fr 1 and Focta, is given in Table 2. Suboptimal extensions for substream number greater than 2 can be found in . The lack of analytical form of the probability density makes it difficult to study detection techniques in the presence of impulsive noise. For SISO systems, some good approximations of probability density of the S α S noise as a mixture of noise have been proposed in . However, the maximum likelihood (ML) detection in the general case of S α S noise is difficult to solve for the precoded MIMO scheme. In this study, we will consider a suboptimal detection technique, based on the assumption of a Cauchy detector . This assumption is justified since the estimated error exponent of the considered S α S distribution (Table 1) is close to that of the Cauchy distribution. x ̂ = argmax p y | x .
x ̂ = argmin ∏ k = 1 n r y k − ∑ i h e ki x i 2 , with H e = HF . In the following section we analyze the error probability of the precoded MIMO scheme in the presence of Cauchy noise (α=1) . Equation 6 shows that the virtual channel is fully characterized by two variables ρ and θ which are the channel gain and the channel angle, respectively. The behavior and performance of the max-dmin precoder depend on these two parameters. Furthermore, ρ and θ are random variables (RV) whose laws depend on the channel. Thus, in this section, we focus on the theoretical laws of these two RV, and especially θ, whose pdf depends directly on the distribution of the two largest eigenvalues of the channel. The main idea is to derive the expression of pdf of the minimum Euclidean distance and then the error probability of the max-dmin precoder. As the channel matrix H is an uncorrelated Rayleigh matrix, W = H H∗ is a Wishart matrix. Using the random matrix theory, we can define the joint distribution of nonzero eigenvalues of a Wishart matrix for min(n t ,n r )=m. λ i = σ i 2 , n s = | n t − n r | and k m = 1 ∏ i = 1 m n t − i ! n r − i ! 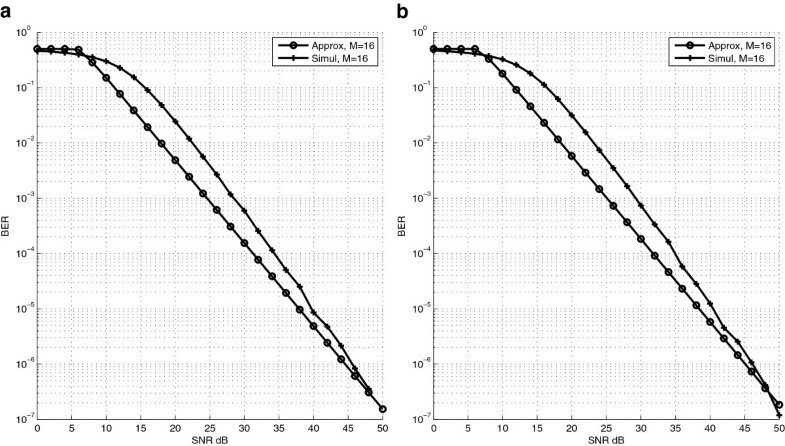 f λ 1 , λ 2 λ 1 , λ 2 = ∫ 0 λ 2 ⋯ ∫ 0 λ m − 1 f λ 1 , λ 2 , ⋯ , λ m λ 1 , λ 2 , ⋯ , λ m × d λ 3 … d λ m .
Γ = λ 1 + λ 2 = ρ 2 β = λ 1 − λ 2 λ 1 + λ 2 = cos 2 θ .
g F r 1 ( z ) = k e − z z n s ∑ n , i , j p n , i , j z i ψ n , j z , β 0 M 1 + β 0 M g F octa ( z ) = k 2 2 ∑ n , i , j p n , i , j z 2 2 2 n s + 3 + i + j e − z 1 + n 2 × e − z 2 2 n ϕ 1 , n + 1 i , j z , 2 + 1 ψ n , j ( z , a ) = γ inc ( n s + j + 3 , ξ ) ( n + 1 ) n s + j + 3 − 2 z γ inc ( n s + j + 2 , ξ ) ( n + 1 ) n s + j + 2 + z 2 γ inc ( n s + j + 1 , ξ ) ( n + 1 ) n s + j + 1 β 0 ( M ) = cos ( 2 θ 0 ( M ) ) ϕ a , b i , j ( x , t sup ) = e − x 2 2 a + 1 t + b + 1 t ∑ l w l t l 1 t sup + β K 0 ∫ 1 t sup e − x 2 2 at + b t 1 t dt + β K 1 x 2 ∫ 1 t sup e − x 2 2 at + b t ( t 2 − 1 ) 2 4 t 3 dt ξ = a ( n + 1 ) z γ inc ( a , x ) = ∫ 0 x t α − 1 e − t dt. f Cauchy x = γ π γ 2 + x 2 . Numerical approximation and simulation - max- d min . Error probability of the max-dmin precoder with a Gaussian noise for different MIMO systems: 2×2,6×2, and 10×2, from right to left, respectively. X = γ tan U + μ. 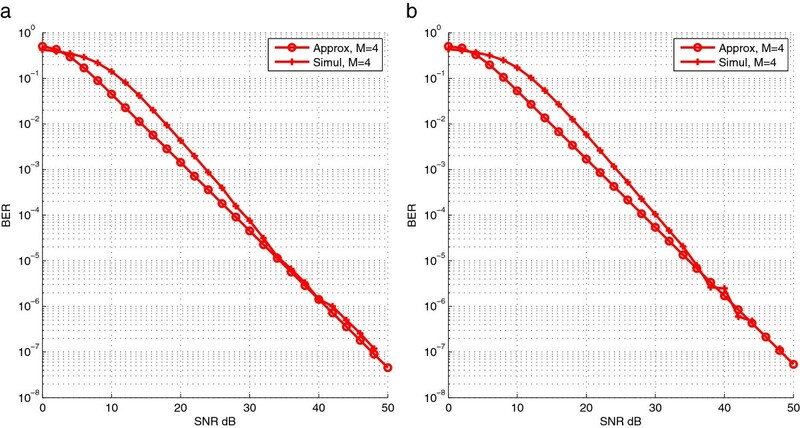 Figure 2 provides the theoretical and the simulated BER versus the SNR ratio for a 2×2 MIMO system with different modulation order in the presence of an impulsive noise modeled by the Cauchy law. By comparing the theoretical results (line with plus sign) and the simulation results (line with circle), we can readily find that the theoretical results match the simulated results of the communication chain very well at high SNR values (>20 dB or BER <10−2) for 4-QAM and 16-QAM modulations. In these cases, the agreement is not so good for the low SNR values. 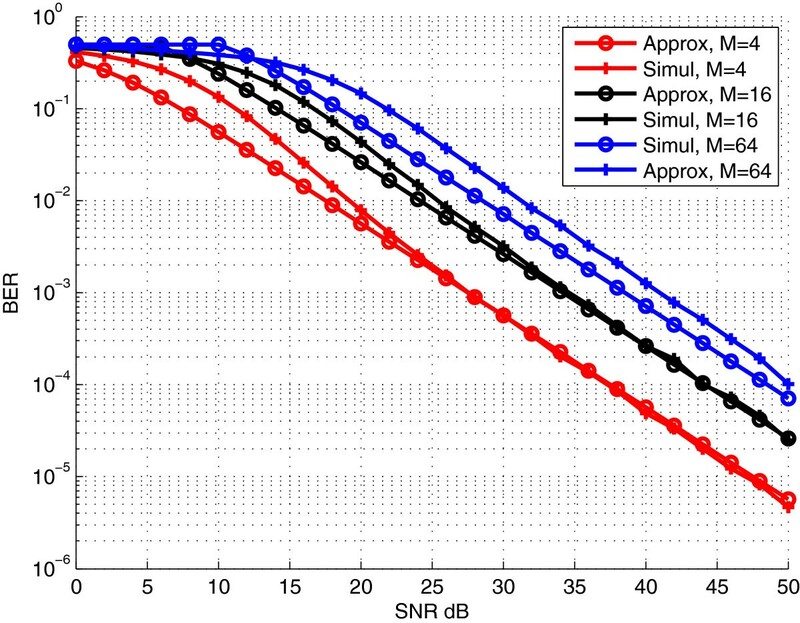 For the 64-QAM modulation, the gap between theoretical and the simulated results is about 3 dB. This demonstrates the interest of the proposed closed-form BER performance only at high SNR. It may be considered as a good lower bound for 2×2 MIMO systems in the presence of impulsive noise. In Figures 3, 4, and 5, we show the performance analysis of 4×4 and 8×8 MIMO systems for 4-QAM, 16-QAM, and 64-QAM, respectively. By comparing the theoretical results (line with plus sign) and the simulation results (line with circle), we can readily find that the theoretical results match the simulated results of the communication chain very well at high SNR values (>30 dB or BER <10−4) for 4-QAM and 16-QAM modulations. For higher modulation, we have to improve our BER approximation by considering more neighbors. With 4-QAM modulation, the 4×4 system provides a high gain at high SNR value compared to the 2×2 system, more than 20 dB at BER = 10−5. However, there is no significant gain when we consider a 8×8 system compared to the 4×4 system with the same modulation order. This approximation may be considered as a good lower bound for any MIMO system in the presence of impulsive noise. Numerical approximation and simulation - max- d min n t =2 n r =2 M =(4,16,64). Error probability of the max-dmin precoder in 2×2 MIMO system with a Cauchy noise (α=1) and 4,16,64-QAM. Numerical approximation and simulation - max- d min M =4. Error probability of the max-dmin precoder in 4×4 and 8×8 MIMO systems with a Cauchy noise (α=1) and 4-QAM. (a) 4×4 MIMO system. (b) 8×8 MIMO system. Numerical approximation and simulation - max- d min M =16. Error probability of the max-dmin precoder in 4×4 and 8×8 MIMO systems with a Cauchy noise (α=1) and 16-QAM. (a) 4×4 MIMO system. (b) 8×8 MIMO system. Numerical approximation and simulation - max- d min M =64. Error probability of the max-dmin precoder in 4×4 and 8×8 MIMO systems with a Cauchy noise (α=1) and 64-QAM. (a) 4×4 MIMO system. (b) 8×8 MIMO system. The considered transmission chain mimics an IEEE 802.11 × PHY modem that involves a bit-interleaved coded modulation (BICM) resulting in the concatenation of a channel encoder, a bit interleaver, and a bit-to-symbol mapper. The channel code is a 1 2 rate convolutional code with constraint length K=7 and defined by the generator polynomials g0=0133 and g1=0171. The frame of encoded data is then randomly interleaved and converted to complex symbols belonging to the constellation alphabet of 4-QAM modulation. This BICM scheme is followed by the max-dmin precoder, which adapts b=2 streams to the 4×4 MIMO channel. Decoding is performed using a soft detection technique considering two different laws: Gaussian and Cauchy (see Section 4.2). For this simulation, 10,000 frames of 800 bits each were transmitted. The channel is quasi-static, so H is assumed constant over the transmission of several consecutive vector symbols. The considered noise is S α S, and the generation of S α S random variables follows the formula proposed by . LL R Gaussian b | Y = ln ∑ S ∈ X b = 0 exp − 1 2 σ 2 y − H e s 2 ∑ S ∈ X b = 0 exp − 12 σ 2 y − H e s 2 . LL R Cauchy b | Y = ln ∑ S ∈ X b = 0 1 / γ 2 + y − H e s 2 ∑ S ∈ X b = 1 1 / γ 2 + y − H e s 2 . Figure 7 corresponds to the max-dmin BER performance in the measured 4×4 MIMO channel obtained in the low correlated scenario (antenna spacing equal to 10λ and ρ=0.57). In this figure, we present the comparison between the two different soft detection techniques for the max-dmin precoder. It can be seen that the detector with the Gaussian assumption gives poor performance, compared to the detector with the Cauchy assumption. For a BER of 10−2, the gap between these two detectors is greater than 6 dB. Therefore, the channel decoder based on LLRs obtained, thanks to the Cauchy assumption, can increase the performance potential of the communication system in this type of railway environment. Max- d min BER performance in the measured 4×4 MIMO channel. Perfect estimation of H, 4-QAM in coded system with soft decoding in noise environment (α=1.253, γ=0.419, β=μ=0). In this paper, we have investigated the performance, in terms of BER, of a precoded MIMO system, based on the max-dmin precoder, in the presence of impulsive noise in the railway environment. First, we have proposed a lower bound on the error probability of the max-dmin precoder in a Cauchy noise environment for any MIMO system dimensions and M-QAM rectangular modulation, which is tight at high SNR relative to the simulation results of the communication chain. The expression is validated by the Monte Carlo evaluation of the minimum distance and the full simulation of the communication chain. The chosen approximation is simple and more accurate, but a more complex form may be found by taking into account all neighbors. Second, we have evaluated the performance of a realistic communication system close to the Wi-Fi PHY layer, including a realistic tunnel channel, based on previous MIMO channel sounding measurements and S α S parameter values derived from distribution fitting of measured transient EMI received at the GSM-R antenna on the roof of the train. These transient EMI are due to bad sliding contacts between the catenary and the pantograph. The log-likelihood ratios, needed at the input of the channel decoder, have been expressed in a Cauchy noise for the MIMO system. We have shown that the soft channel decoder based on those log-likelihood ratios behaves remarkably well in the studied tunnel context, even if S α S impulsive noise is considered. Research is also underway to provide an approximation in correlated channels and improve the detection technique in other MIMO configurations. This work was supported by IFSTTAR, the French project CORRIDOR (COgnitive Radio for RaIlway through Dynamic and Opportunistic spectrum Reuse) funded by ANR and the regional CISIT (Campus International Sécurité et Intermodalité des Transports) program funded by the North Region in France and the European Commission via the FEDER.